The Power Broker is a great book, obviously representing a ton of research, and giving a very detailed view of its subject's rise and fall. It's a complicated, intricately woven history, and Caro walks his reader carefully through it, examining virtually every detail. 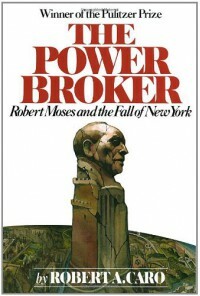 You come away with a real understanding of the various ways that a man like Robert Moses can turn influence into power, and power into greater power still. (You also come away with a spectacular understanding of the author's incredible disdain for Moses himself.) You are also given numerous opportunities to marvel at the ways in which an intelligent, forceful, remorseless man can dominate an entire city. That said, this is the first time I ever wished I had read the abridged version of a book. Not every one of this story's threads deserved quite the level of examination it received. It's worth reading, to be sure. But it could have been more so, if reading it weren't quite this much of an investment.